What Are the Most Uncommon Pet Birds? Many people are familiar with the most common and popular types of pet birds, such as Budgies, Finches, and Cockatiels -- but finding those who can list some of the more uncommon species that are sometimes kept as pets can be a challenge. Whether you are researching more exotic species in the hopes of adopting a unique pet or you are just curious, you can find out more about some of the most uncommon pet birds in the world in the information below. Be prepared, however -- some of these "strange birds" have specialized care requirements that make them less than ideal prospects for the average bird owner. 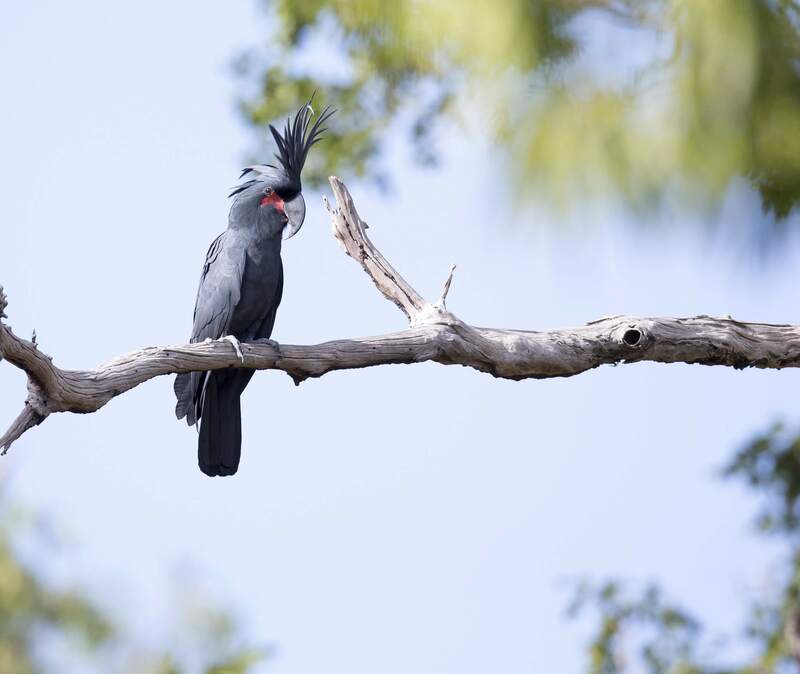 A bird that is as equally impressive as it is uncommon, the Black Palm Cockatoo is an eye-catching species that originates, like all Cockatoos, in Australia. These birds are very large, reaching lengths of up to 2 feet from the tip of the tail to the end of the beak. They are highly intelligent birds but aren't known for being especially affectionate. It is important that they receive proper training in order to make suitable pets, and for that reason, they are only recommended for highly experienced owners who have lots of spare time on their hands. Beautiful and unusual, Victoria Crowned Pigeons are large, striking birds that are actually quite gentle and easy to tame. While they are intriguing to say the least, they need a lot of space to live in and can be challenging to keep for this reason. They spend a lot of time running around on the ground, so they can't be kept caged like some other bird species. Instead, those who keep them must provide them with a large room so that they are able to get the exercise that they need to thrive. Also known as the "Queen of Bavaria Conure," the large, colorful, and striking Golden Conures are truly a sight to behold. In relatively recent years, however, they have become increasingly hard to come by in the pet trade, and are considered rather uncommon as a result. While there are breeders out there that offer these birds for sale from time to time, the sales of Golden Conures are strictly regulated, so it can be a difficult process to get your hands on one. Another beautiful and uncommon bird from "Down Under" is the brightly feathered Australian King Parrot. Their beautiful bright red and green plumage makes them a highly sought-after species, but they are less commonly available as pets than one might think. Highly intelligent birds, they can form close bonds with their owners but seem to be a little more resistant to affection than some other types of birds, making them good candidates for owners who have plenty of experience keeping and working with hookbills. Large birds, they can reach lengths of up to 18 inches from head to tail and need plenty of space to exercise and play in order to thrive in captivity. Last but not least on the list of uncommon pet birds are the noble Owls. While Owls are commonly depicted as loyal pets in books and movies, in reality, they are simply not suited to life in captivity. There are several reasons for this, perhaps the most important being their unique dietary requirements -- in order to stay healthy, Owls must be fed whole rodents on a daily basis. Attempting to supplement or change their diet inevitable fails, making it very hard for the average bird enthusiast to be able to keep an Owl successfully. Coupled with the fact that keeping captive Owls are illegal without special permits in most places, it's no wonder that they are a very uncommon pet.